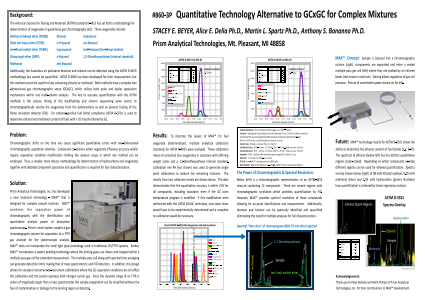 Author(s): STACEY E. BEYER, Alice E. Delia Ph.D., Martin L. Spartz Ph.D., Anthony S. Bonanno Ph.D.
Abstract: One-dimensional gas chromatographic (GC) analysis suffers from limited peak resolution for complex, compound-rich (100+) mixtures. Thus, addition of a second-dimension (2D) separation is often required for an additional separation mechanism. Conversion of 2D data to qualitative or semi-quantitative concentration results requires complex mathematical analysis which is difficult to maintain when chromatographic retention time shifts occur. MAX™ is a new detection technology for GC which overcomes the qualitative and quantitative limitations of GCxGC. The novel optical detection system employed in the GC-MAX™ technology has proven calibration stability of better than 5% and < 1% RSD on repeat measurements. Once the MAX™ technology is calibrated for a compound, that calibration can be used for the life of the system or any similarly configured MAX™ technology system. In addition to being fully quantitative, peak identification is also easily performed on co-eluting compounds by a novel spectral analysis algorithm based on chromatographic retention indices. The capabilities of this new technology will be demonstrated with ASTM D5501 Test Method for the Determination of Ethanol Content of Denatured Fuel Ethanol and ASTM D4815 Test Method for the Determination of MTBE, ETBE, TAME, DIPE, t-Amyl Alcohol and C1-C5 Alcohols in Gasoline. Here the advantages of the MAX™ technology to both quantify the high concentration ethanol concentration along with the low level oxygenates in a single analysis without the use of a second-dimension separation to remove hydrocarbon interferences/co-elutions will be discussed.